What a beaut weekend. For the first time in what seems a long time, I was commitment free. I got to walk around my neighbourhood enjoying the fresh air and blue skies of winter in sunny Perth. Thinking about why I felt an extra pep in my step, I realised it was more than just decent sleep and a leisurely breakfast. Sure, there’s a lot to be said for free time but this weekend it really dawned on me that I don’t sit with newspapers and coffee anymore. I’ve loved newspapers forever, so I was kinda surprised when I thought about it. It’s partly because this is a fundamentally one paper town but mostly because I take my flat white with my twitter feed and my pick of The Guardian or Wisden Cricket Weekly. And if I’m alone, I listen to the radio or a podcast or a footy match via my smart phone. I rarely watch the footy with the TV volume unmuted. Even Friday Night Footy. Friday’s was a cracking game but I was also keeping an eye on the NRL Women’s State of Origin at the North Sydney Oval. I enjoyed the build-up to the game (of a code I know relatively little about) through the relentless enthusiasm of Mary Konstantopolous (The Roar and Ladies Who League). I could relate to her excitement because it wasn’t that long ago that the AFLW launched and … well, who needs an excuse to get excited about sport? The game between New South Wales and Queensland is not new (it has been previously called the Interstate Challenge) but the significance of the clash being the stand alone State of Origin was not lost on me. I was thrilled for all involved that the game was well attended and appreciated by a decent TV audience. I smiled at happy snaps on social media and was delighted by the overwhelmingly positive response to the post-match kiss between opposition players Vanessa Foliaki and Karina Brown. I think that’s one of the reasons I had that pep in my step this weekend. A sporting public display of affection had been noted by the NRL and shared accordingly. Not with an apology or a justification, just shared. And supported by footy fans of all stripes across the nation. Smiling thumbs up emojis for all! I’ve enjoyed watching the Swan Districts women play this year and although I am a rusted on Fremantle Docker and East Fremantle supporter, Swans let me MC the Club jumper launch in April. I could say it was the first time I’ve done something like that but really … I didn’t have to do much. Swan Districts is a great club: it looks after its people, the V Swans program is brilliant, Juddy is the seniors skipper and head coach is Nicole Graves. Well, Gravesy was head coach but has just been appointed General Manager of Women’s Football at Carlton. Lucky Blues. Swan Districts won all three grades in the WAWFL last year. Just sayin’. But back to this weekend. This blissful, sunny bruise-free weekend. I trust the Reclink Community Cup was a huge success in Melbourne. We play them in Perth too now. The Newshounds will take on the Bandgropers in September. Here’s a pic from last year’s game, just to prove that Darcy Vescio is loved everywhere. 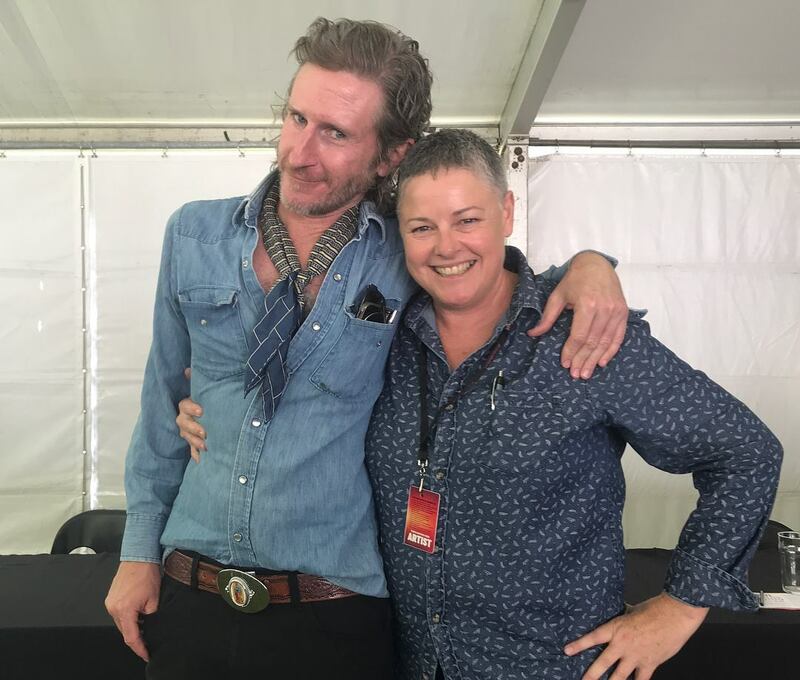 Also, this is me and Tim Rogers at the Perth Festival Writers Weekend. I’m yet to convince Tim he should play on the Newshounds team but he mentioned something about how $20 and a carton of been might seal the deal so we’ll see. Finally, chookas to our podcast cousins at the Outer Sanctum. You know we love your work! I appreciate you always put in the hard yards. Have fun this week. It’s 2018. Fremantle Docker Hayley Miller was a late inclusion for this weekend’s State of Origin. I caught her on the way to the airport on Thursday morning. Four days into my new role at RTRFM 92.1. Thankfully, Chris Mason likes footy too. It’s Friday night before the big game. The undefeated Brisbane Lions host the exciting Adelaide Crows at the Gabba in Brisbane on the Gold Coast tomorrow. But I’m not going to get into the shambolic scheduling or Grand Final venue mystery here. It’s time to file some happysnaps and happy thoughts about the inaugural AFL Women’s season. I guess this is the last ‘Grand Final Eve’ we’ll have without a replay of the previous season’s premiership decider on FTA TV. This is the first, after all. This is not a review of each of the 28 games played to date, nor a preview of the big game tomorrow – there are wiser footy heads than mine who can steer you in the right direction if that’s what you’re looking for. This is a snapshot of why the eight weeks of AFLW was so much fun for me. I could just leave the brilliant First Dog on the Moon cartoon here as Dog has nailed it. But I don’t barrack for the Western Bulldogs. There was an upside to the 9 December fixture release … the season launch was barely 8 weeks away. In between times, I was home for Christmas in Perth so my beloved and I made the trek to Freo Oval to watch the Fremantle Dockers train as often as we could. The trips were usually after a spell at the beach and often ended with ice cream. It might have been summer in W.A. but it was never as hot as the games I watched in the opening and closing rounds here in Melbouren. Sheesh. Anyway, back in January I did my best to get to know the Freo playing list and snuck in an interview with coach Michelle Cowan for Chicks Talking Footy. The other Chick fortunate to have her club in the AFLW, Bec, lined up Adelaide coach Bec Goddard. I’m not sure if this was when CTF Bec first dubbed AFC Bec the “magical-unicorn-fairy-princess” but I’m pretty sure it was the beginning of a beautiful (possibly one sided) friendship. The Crows played the Dockers in Darwin in a scratch match that would prove to be the first of two games the Crows lost in the N.T. this year. Unfortunately the result was reversed when the premiership points were up for grabs in round four. Freo was a pre-season fancy for the flag for many. I dared to dream the women would kick off the trophy collection at Fremantle Cockburn* but it was not to be. Onward and upwards. Getting to watch the squad train and play has been loads of fun. How good is footy? Seriously. The pre-season cheer squad. My beloved cheers while Kira Phillips runs laps around Fremantle Oval. I know it’s cheesy. I love it. I had a ball (pardon the pun) at the season launch and grabbed some interviews at the Captains Call. AFLW Premiership Cup at the Captains Call. 3 Feb 2017. I guess Daisy was already busy racking up the stats. I was at the Collingwood v Carlton opening game at Olympic Park Oval Princes Park. It was fabulous. I met a young couple, Tim and Jo (at her first game of footy) on the way to the ground. I suggested they share the free AFL(W) Record. The young vendor said “Oh, don’t worry, we’ve got plenty!” I wasn’t so sure about that. A couple of hours later the AFL CEO was apologising to fans who couldn’t get in. Oversubscribed. Just a tad. I had Mardi Gras flashbacks of the wall-to-wall RHI crowd waiting for Kylie to take the stage. The heat from the 25 000 + crowd came in waves and the atmosphere was delightfully celebratory. Darcy Vescio stole the show. What a night! The next day was super hot, Melbourne style. Urgh. The kick to kick that I’m sure would have accompanied the launch of A Footy Girl’s Guide to the Stars of 2017 had to be taken inside. Only Collingwood Ruck Chick, Emma King, was allowed to play with the ball inside. We all know those rules. The Western Bulldogs enjoyed their first game of the season. I felt like the only Docker waving the purple flag at Whitten Oval but as Ross Lyon says: feelings are not facts. It was a great night anyway. The queue for a happy snap with Susan Alberti was longer than the line to buy beer. Or icecream. All night. I attempted my first match report. Fremantle’s first home game was a narrow loss to eventual minor premiers Brisbane. The third game was even closer; the first drawn AFLW game of 2017. In the mean time, Angela Pippos launched Breaking the Mould: Taking a Hammer to Sexism in Sport at the MCG and Clare Wright gave a fabulous speech. On the way to the launch I walked past the statue of Ron Barassi. As I walked past, a young girl of 9 or so ran past and glanced up at the bronzed RDB. I smiled at the thought of another Melbourne FC legend who might have a statue on the Avenue of Awesome outside the G one day. It’s not difficult to imagine Daisy Pearce in that place. I hope she gets to play an AFLW Grand Final on the MCG before her brilliant career ends. International Women’s Day at the MCG. The AFL invited girls and women to have a kick on the hallowed turf with a call to #BeBoldForChange. My IWD celebrations rolled into the weekend as Fremantle won their first game. Collingwood played GWS at Olympic Park on the Sunday morning of the long weekend in Melbourne. It was a high scoring game made even more enjoyable because of the friends I watched with. Sharing the game (including footy cards and inflatable oversized hand) with my mates’ 12 year old daughter was enormous fun. We shared stats and opinions and she collected autographs and anything else offered. Which, for the record, included free apples, gum, posters and … quinoa. I guess Collingwood know what they’re doing! The first season of the AFLW ends on Saturday 25 March, 2017. The competiton has been fantastic. The players have been available in so many ways: TV, radio, print and myriad digital platforms. Thanks to the girls and women who helped build, shape and lobby for a national Aussie Rules league over the many many years. And to the women of AFLW 2017 – thanks. It was awesome. CTF Skipper squeezed the AFLW opening game in before giving birth to another Hawks fan! Did you know Sherrin makes footballs that glow in the dark? Of course! *let’s never speak of this again. I’m looking forward to Saturday 3 September, 2016. It’s going to be a three thermos day. For me, that means I’ll be on the road (well, tram and train) all day and will need to fill my thermos at least three times. Sure, I’m spoiled for choice when it comes to coffee in Melbourne, but I will be spending a serious amount of time at Whitten Oval watching the Melbourne v Western Bulldogs Women’s All Stars game (and the Youth Girls curtain raiser) and I won’t be giving up my seat to queue for caffeine at any point. The 2016 AFL Home & Away season is over* and there is a ‘bye’ before the finals kick off next weekend. While there are countless footy teams competing across the country, the All Stars game is the highlight of the first weekend in September for footy lovers like me. So, instead of listening to the usual Friday Night Footy tonight, I’m catching up with the latest podcasts from This AFL Life, Trailblazers and Girls Play Footy and I’m thinking about how much has happened in the last few months and how much I’ve enjoyed this fantastic footy season. Chicks Talkin’ Footy. Yep, I’m one of those women. In 2016, JOY 94.9 gave the go-ahead to a thirty minute weekly program pitched by our skipper, Fiona Newton. In April we got to know each other a little … mostly on the air! I discovered the six Chicks included two Hawks, a Bomber, a Tiger and a Crow. Heave Oh. We focussed on the highlights of the AFL round, Women in Football and what we considered to be Out of Bounds. That was before Michael Barlow created his own podcast of the same name. Sorry Mick, I still haven’t got around to listening to OOB but you’re on the list! Please don’t leave the Dockers. In May, we enjoyed the Purple Bombers event to recognise the International Day against Homophobia, Biphobia, Intersexism and Transphobia aka IDAHOBIT. We’ve since talked with other LGBTQIAFL supporter groups; the Rainbow Swans, Blue Roos and yes, Dorothy, we’ll get to the Ruby Demons soon! We interviewed Saints Assistant Coach Adam Skrobalak and were delighted by his offer to organise our team T-shirts. Thanks Adam! As a spectator I squeezed in a couple of games during the Youth Girls National Championships and found a new favourite player in Courtney Hodder. I’m super excited about watching her play in this weekend’s curtain-raiser. On CTF we chatted with amazing athlete and Melbourne Footballer, Cecilia McIntosh and ignored Fremantle’s season completely. We enjoyed the Melbourne and Brisbane Women’s Exhibition game and often talked about the GWS Giants’ hair. On the same day the NWL was launched, Nicole Hayes from the Outer Sanctum was our CTF guest. Nicole’s visit was just a few weeks after the launch of the fabulous collection of stories From the Outer: Footy Like You’ve never Heard it and what seems like, in retrospect, just a few hours before the OS crew took on the world. I find it particularly challenging to distill the events of that week and to clearly articulate how much I admire the women of the Outer Sanctum. Suffice to say, CFC President Eddie McGuire’s comments during the MND Freeze were beyond the pale and OS called him on it. Nicole Hayes explains the ‘viral media storm’ (and so much more) here. 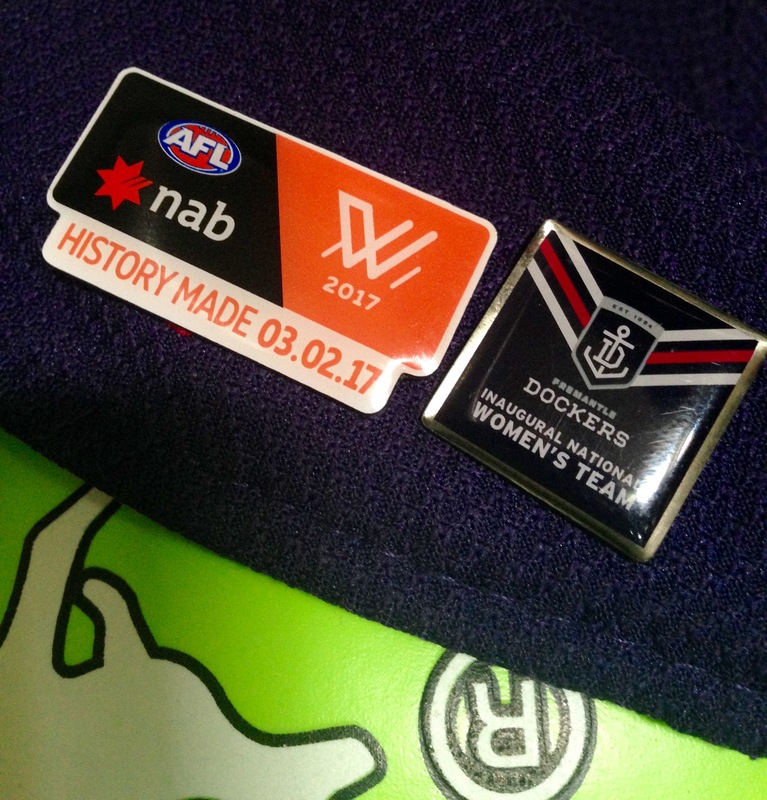 The following week we chatted with the trailblazer former player and coach Peta Searle and as June wore on, the Dockers hit a purple patch won three games in a row. Michael Barlow, again, please don’t leave the Dockers. In July, CTF had a ball while some may have struggled through winter and mid-season slumps. We listened to Caroline Wilson deliver the David Parkin Oration. We joined the audience for another brilliant episode of Marngrook. We prepared for another AFL first … the Pride Game between St Kilda and Sydney Swans. To say we were excited is an understatement. 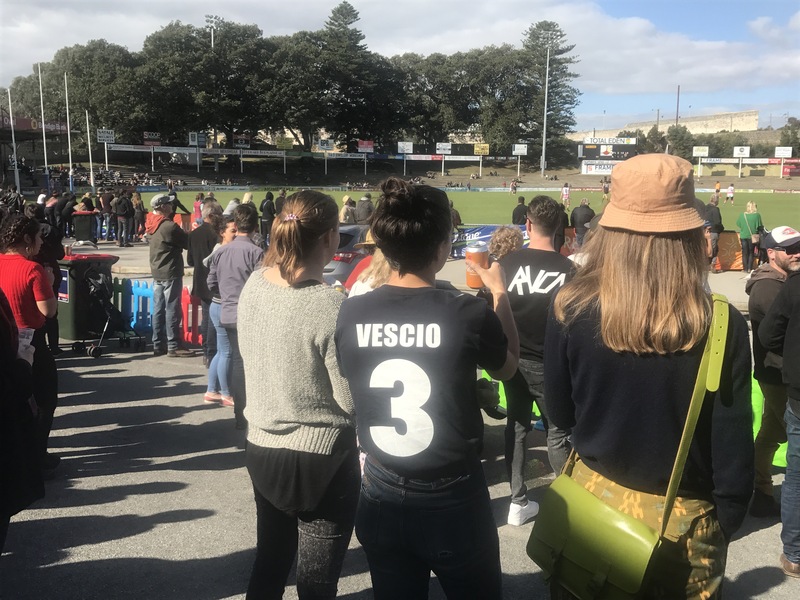 The AFL’s mantra was “everyone is welcome at the footy” and the Saints & Swans showed their support for LGBTIQAFL supporters, players and communities. During JOY 94.9’s live four hour outside broadcast, five of the six Chicks were joined by guest co-hosts Alicia Sometimes (Outer Sanctum) and Shelley Ware (Marngrook) to interview 32 guests; players, politicians, supporters, performers, journalists and activists. We had such a good time. There are 19 other podcasts where this came from and thanks to Betty Sujecki and Hamish Blunck we have a few pics too. 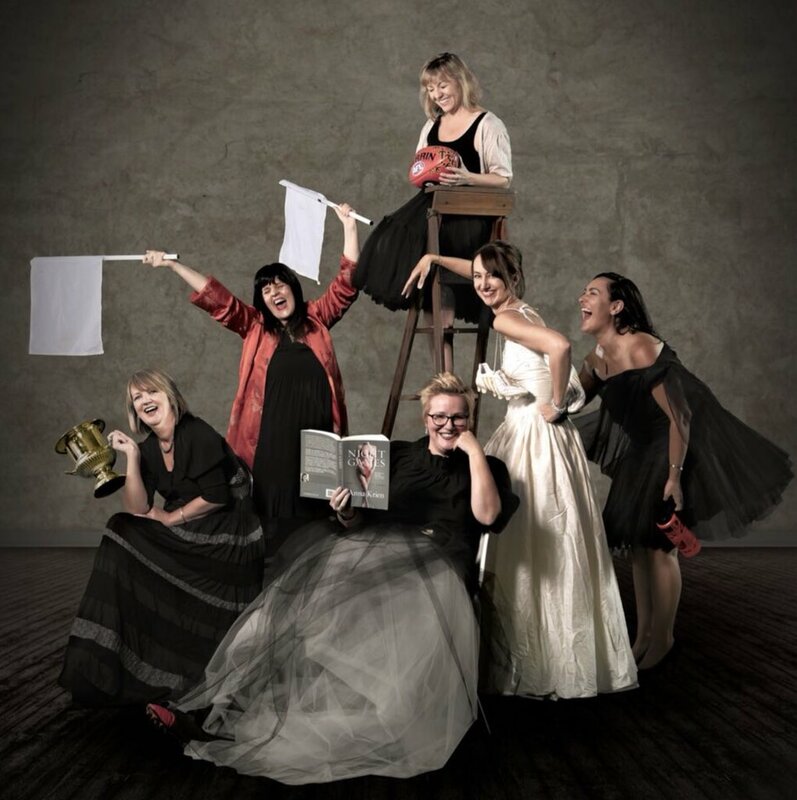 (l-r) Motty, Danae, Mel Hickey, Rachael, Katie Brennan and Bec. I’m still surprised I didn’t pull a hamstring that weekend. 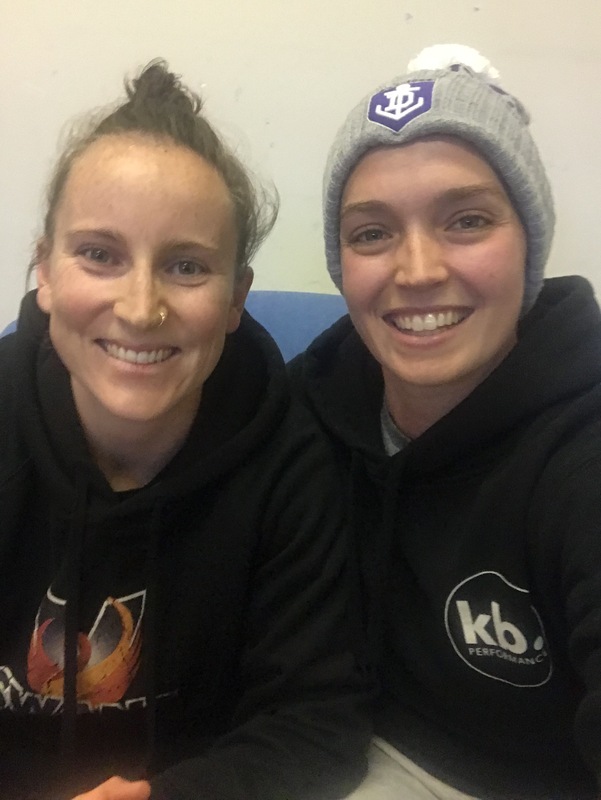 Before the Pride Game, the Outer Sanctum crew hosted a Kick & Coffee session with the Melbourne Uni Women’s Football Club & North Melbourne FC . What a hoot! August flew by, and Fremantle won just one more game to send off the magnificent Matthew Pavlich. The Chicks continue to talk footy wherever and whenever they can. I had the great pleasure of interviewing Dr Susan Alberti ahead of the Women in Football Charity Breakfast. It’s been a massive week; Australian Story featured Alberti and Mo Hope in a beautiful reflection on women in football, CTF chatted with out and proud singer/songwriter & Adelaide Crows Ambassador Beccy Cole and Marngrook had a brilliant panel of women to talk about football last night and its people. Most of the 500 or so people at Dr Alberti’s breakfast this morning would agree we’ve come along way in 100 years … but we’ve still got some distance to travel. While the ever vigilant Erin Riley clearly explains the challenges of equity issues in the newly formed AFL National Women’s League, I’m going to take some more time before I add my two cents about where we are now … it’s the first weekend in September and the All Stars game is the centre of my footy universe. I’m going to put the kettle on now, tomorrow is a three thermos day. * just quietly, this Docker is relieved. Does anyone remember the NAB Challenge team? Saturday 16 July 2016: The Most Wuthering Heights Day Ever. It was also a most delicious Winter’s day in sunny Melbourne. The sun shone on the crowd gathered at Kings Domain as they shared a passion for the inimitable Kate Bush, her signature song and the strangely wonderful choreography that is part of the collective consciousness of those who love the song first heard in 1978. I’m sure the organisers of TMWHDE were prepared for a day with wind and rain, after all the song begins with “out on the wiley, windy moors, we’d roll and fall in green…” but thankfully we enjoyed an amazing warm and still Saturday arvo with friends old and new. What a beautiful day. Thanks to the organisers, participants and … Kate. While the Fremantle Dockers are yet to win a game in 2016, I’m enjoying the AFL season immensely. Well, it’s because of Chicks Talkin’ Footy. Yep, JOY 94.9 lets me talk about footy with a crew of diehards: Fiona (Captain) Newton, Bree (Tiger) McAullay, Susannah (Bomber) Mott, Rebecca (Crow) Dahl and Rachael (Hawk) Hopkins each Wednesday night from 8.30pm. We have 30 minutes to review the games of the recent AFL round and preview the games to come. In between we like to talk about the state of the game and in particular the role and status of women within Aussie Rules. We talk about the dodgy and the divine on and off the field. We’re loving the focus on the National Women’s League, including this year’s exhibition games. In May, Cecilia McIntosh joined us to talk up the game and we discovered just how many serious operations the former bobsledder, javelin thrower, Commonwealth Games medalist and Olympian has survived. Onya Cee! You can listen to the podcast below. (left to right) Me, Cee, Bree and Fi. I will be joining some of the fabulous volunteers of Alpine Radio to deliver a short course in radio program making from January through April. Lucky me … Mount Beauty is a beautiful (pardon the pun) location! … and the view from the rear of the Neighbourhood Centre. The training is provided by the Community Media Training Organisation.